I would Like to share a few highlights from the Crop Protection Clinic in Norfolk. Charlie Shapiro (cshapiro@unl.edu) had a presentation on the “Long View of Nitrogen Recommendations from Nebraska Extension”. UNL research on nitrogen goes back to the 50’s when Don Sanders and Prof. Olson were looking at how fertilizer use affects the environment. UNL’s first nitrogen formula was done by Dr. Bob Sorensen in 1972. I found this interesting because I worked for both Prof. Olson and Dr. Sorensen at that time. 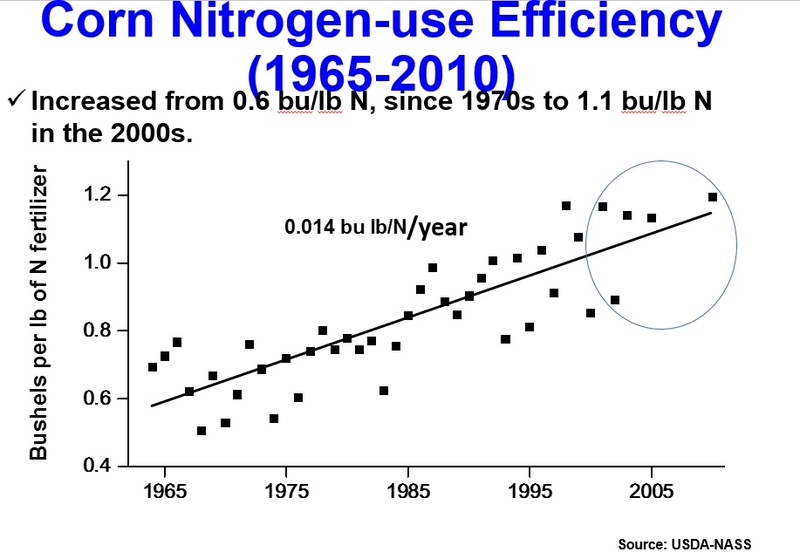 One of the slides that Charlie showed was one that shows the change in nitrogen efficiency since the 1960’s. We’ve made a lot of progress but we still need more. Dr. Stevan Knezevic (http://agronomy.unl.edu/knezevic ) discussed weed resistance and dicamba tolerant soybeans. Waterhemps and Palmer Amaranth that is resistant to 3 modes of herbicide action is becoming common in Nebraska. Illinois has waterhemps and Palmer Amaranth that is resistant to 5 modes of action. Five modes of resistance make them resistant to all the available herbicides. Herbicide resistance is something that everyone needs to take seriously. Dr. Knezevic also discussed the studies he is conducting with dicamba on nontolerant soybeans. Nontolerant soybeans are very susceptible to dicamba. Soybeans that were sprayed with 1/500th of the normal rate of dicamba had severe damage. Anyone using dicamba needs to be extremely cautious. Crop insurance only covers natural causes of loss and not herbicide damage. We don’t want situations where people are killed over dicamba disputes as happened last summer in Missouri. The “2017 Guide for Weed, Disease and Insect Management In Nebraska” (click for link) is available at this website. It has 324 pages of very useful information. You should get a copy. I’ve got a copy of the 1972 version. It was 8 pages long. While the physical side of farming has gotten easier the management side has gotten much more difficult since 1972.